Method of Fermentation: Natural yeast fermentation. Crushed using a pneumatic press, fermented in stainless steel. Maceration between 20-50 days at 18-25℃. Daniele Saccoletto created this estate over the past 38 years, beginning with nothing. The 14-hectare property is the labor of a lifetime, built all with his hands. Romeo the cheese-rind eating pit bull greeted me from the Sacoletto’s balcony. I looked suspect emerging from the tiniest Peugeot ever made, the morning after a sleepless red-eye flight into Milan. Daniele had left a note for me impaled on the iron of his driveway gate, which bestowed the calm of being anticipated. Traveling halfway around the world for appointments with strangers can create anxiety, and seem unreal. Do they exist? Do they believe I exist? As Romeo continued the serenade, a sleepy son emerged, spoke, produced espresso which was (as it often is) perfect and necessary. We filled silence comparing Torino to Paris and considering alternate land masses for advanced Anthropological study. Oceania became a front runner. Lombardy and the Piedmont are stark neighbors. Convenient for navigation. Moving west on an unfamiliar Autostrada, it was clear when to focus my eyes and study roundabout signs in detail. San Giorgio Monferrato was easy to find, at first more a street than a town. After cordial exchanges and a mercifully brief cellar tour (if you’ve seen one…), we waded into wine. Daniele started with ripe Grignolino, passed through Freisa on the way to Barbera, a Monferrato Rosso blend and some sweet wines. We tasted slowly, exchanged views, often circled back to taste from tank- (un-bottled) versions of a wine, older vintages, and repeatedly side-by-side examples of the same wine under cork and Stelvin. The latter closures were uniformly at an earlier stage in their development, a point that was driven home by a funny little screwcap 200 ml bottle of 2001 Barbera that Sacoletto produced. It was earthy and good, playing the part of the carefully matured Piemontese red to the hilt. What doesn’t happen is the story here. Daniele uses no chemicals (other than the standard copper and sulfur, and those are applied frugally, with ash, enlightened thought and care) in the vineyard or cellar, does not add any filtration elements (particulates are removed slowly via gravity) local yeasts are left to do their job and are not hustled out of the vats by any purchased industrial yeasts. All music to my ears. The wines taste beautifully natural, their make-up free true form resonating someplace deeper. When energy waned we walked out to Daniele’s 25-year-old Transit van and set off for lunch. Saccoletto was impressed by my fuel-friendly tiny rental car. He is 38 years along a path to working a better way, leaving a better land behind, wasting less fuel. He proudly pointed out his old ride had maybe 120K on the odometer. We compared life histories and waded through the ever-present America: Myths, and Myths based in Reality segment of getting together with a European supplier. Should he be afraid of being shot if he visits the USA? Winemakers frequently (for-real) ask me this. Yep, that’s our rep abroad. Is Obama popular enough to win the upcoming election? Are American banks/the political system corrupt enough to ferment a populist uprising? I put on the TV anchorman centrist costume for much of this stuff, unwilling to jump off the diving board of my own views while cogniscent that my traveling companion is a prototypical organic farmer. Saccoletto’s ancestors lived in the Veneto. After two World Wars leveled their existence they migrated west to Monferrato. Daniele started in 1974 with nothing. He rented land until he could afford to buy it. He built his cellar (in 1989) and winery (in 2005) piece by piece as money allowed. Today his estate farms 11 hectares of Barbera, Grignolino, Freisa, Nebbiolo, Moscato and Syrah. He learned much of what would eventually determine his estate’s philosophy from the legendary Luigi Veronelli. Sacoletto also cooperates with a local viticultural experimentation college to perfect his vineyard work. Through this partnership he learned to train his vines differently, with a shorter trunk and a fascinating (he’ll have to explain it to you) pattern of pruning that allows enough shoots to remain to get 4-6 grape clusters per vine, and also prunes back enough vegetative material to allow for the formation of a good humus between the rows, with wildflowers, nitrogen-fixing legumes and old grape vines as its base material. Daniele intentionally avoids machinery that would compress the soil between his vines, opting for by-hand techniques that create a healthy, balanced soil and soil cover that can retain the right amount of moisture and nutrients even in erosion-prone steep hillside sites. He describes harvesting by hand into small baskets as an epiphany. “It all begins with this.” The fruit is not damaged by invasive machinery or by being chucked into larger vessels , therefore it reaches the cellar clean, sound, making excessive use of SO2 as a spoilage prevention agent unnecessary. He clearly loves the history of this land. He speaks of Napoleonic towers, Spanish invasions, beautiful churches, farming as a child with his brother on steep calcerous slopes. By hand. I down my 4th espresso of the day at 9am. I’m very close to Daniele Saccoletto’s house, and I’m early. I loiter in a gas station café, eat an apple and a pastry, and plough through my notes for the 17th time. I’m very good at treading water. Daniele Saccoletto is freshly returned from Roma and is in good spirits: he sold a vanload of wine at a trade show in the capital. I’m not surprised, his wines get effusive praise when I pour them at events. Not too much changes at this estate, which is for the better. I like the wines how they are. This year Daniele did start doing fermentation in big wood barrels. 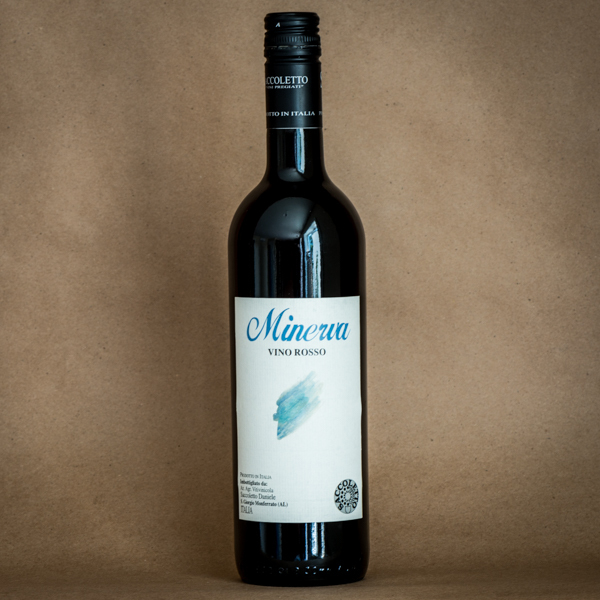 The 2013 Minerva Barbera tasted of high acid forest berries: tart fruit that’s sure to be better in one year. I prefer drinking wines that retain this rare level of freshness. Daniele is a for-real farmer with good fruit to show for his significant efforts. The 2013 Carnalasca Grignolino is actually quite good now. It’s too young, but I like it. Lean, spicy, wild: delicious when drunk cold from the tank. The 2013 Fiordaliso does smell too young. There’s more tobacco in the mix and the distinct (eventually positive) character of young unfiltered wine. It’s pleasantly tannic today. “The (Freisa) grape is very mature when I pick it,” Saccoletto said. “Wine must have “clothes” to last a long time. Sulfites, tartrates, anti-oxidants.” His wines are well dressed, and we bring them to the states after significant time in cellar. Because of the natural stability of what he produces Saccoletto only adds 15-20mg of sulfur to his reds. He’d like to come to America. It would be a wild time. I owe him some sightseeing. Over the last few years Daniele has shown me churches, castles and forts around Casale, close to his home town of San Giorgio. And there have been memorable meals. I’m not sure what he’d think of my home state of North Carolina. He seems fond of the foods, the architecture, and the long history of his native Piemonte. Our Piedmont has comparatively little of that. We have culture (of course) but it’s all so new! I find North Carolina anarchic in comparison to ordered, fully-formed and slow-to-evolve Piemonte. The ideas at play in the kitchens of the USA, the seemingly haphazard development patterns that I watch scattered along miles and miles of highway as I bisect the state, the speed of change: it’s not Italian. I like a lot of it, and maybe Daniele will, too. He’s into Luigi Veronelli, and that guy was an anarchist. I find barbecue gets a mixed reception from Italian visitors, by the way.